I would prefer to be optimistic; but like the Titanic, if you wait until you see the ice berg it's too late to avoid the colision. The "real" ice berg is still to bee seen; that's when China decides to raise the interest rate on the three Trillion + in loans and we can't make the payments. In the short run, the most meaningful thing to do about the deficit is enlarge it, because the first stimulus package clearly was too small. Reductions can be achieved by getting out of Irak and Afghanistan. The Dems reduced the deficit already this year, and as long as they stay in power, will continue to do so. If the GOP takes over, then it's just more of the corporate welfare and special interest giveaways that got us in this mess to begin with. The deficit is easier to work on than he actual debt. Since there is no war on until the next republican president eliminating mythical needs of the military is the place to start. If that money has to be spent, have it go towards education where it can better society rather than destroy a country just to keep the military machine going. Well can reduce it about 800 billion by not continuing tax breaks to millionaires. No. Let's all go shopping and that will force business to hire extra personnel. It is never too late. All we have to do is contribute to USA. Everybody is good at something. Barter, sell, market your talent at your local flea market, mall, street corner, thrift store, e-bay, craig's list etc., Our America will be back into prosperity in no time. Jack: No one cared about the deficit from 2000 until 2008 when the deficit went from $4.4 trillion to $12.2 trillion. Why? It is not to late to do somethings about the deficit, but the last time anything was none President Clinton was in the White House. 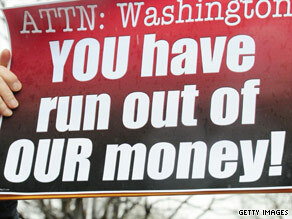 President Obama will probably cut the deficit by $100 billion by 2012. What? You mean ending the wars, and cutting spending back by 20 or 25% is too late? Why not end the wars now? Why not bring back all the troops from all countries now? Why not end the bail outs? Why not end nonsensical minimum-wage laws that prevent teenagers and first-time workers from learning a trade or gaining experience? Why not end the FED, and return us to sound money? Why not return us to a free market system so that businesses and citizens with a heart can flourish? Entitlement reform is desperately needed, but Republicans and Democrats would use such reform as weapons. We need the third party to come in and moderate. As long as Congress has to run every two years and the Dems block needed SSA reform by trying to scare the old people every 2 years, it is not going to happen. Absolutely not. A 5% deficit tax with no exceptions, exemptions or loop holes. It would be painful but the American people are not completely stupid. We all understand the deficit must be paid down. 5% no matter if you make a hundred dollars or a billion dollars added to a balance budget amendment would go a long way. Yes. The deficit is structural. It's why Dems and Reps pretend like they are going to do something about and then don't. I hate this question. It's the debt I wish we could focus on. Think far, far back to the Clinton years. Taxes went up a little and guess what happened? We were able to pay the bills! That needs to happen now. Republicans and the few Democrats who tout tax breaks for the super rich are doing nothing more than pandering to the folks who write their campaigns big checks. Of course it's not "too late," but it might be if the Bush tax cuts are extended. We need to focus expenditures that are investments in our future that create value for future generations. Current political debate misses this point entirely. As a Canadian living close to the U.S. border, U.S. politics are as much a part of our news as Canadian current events are. We have deficits at all levels of government. My question is:"How do government leaders avoid them?" Any politician opposed to helping the economy would probably be opposed to federal aid for a community struck by a natural disaster. Or, opposed to funding combat operations in a country where victory, as we once understood it to be, is non-existant. Arithmatic is a constant. Politicians are inconsistant. Pick your priorities and then your political leaders. Personally, I do not point fingers unless I am shaving. The deficit, has became something that is almost laugh able. For most Americans it has not only became a fact but a way of life. In a time when if you can make it paycheck to paycheck your lucky. It seems like with so many out of work and hurting just to get by. The government would spend what money it dose have more wisely. One way to create jobs and help the economy it to work on our failing infrastructure. Another why would be to create goods in energy saving technology. Have a factory that makes affordable solar panels. Its not only creating jobs and helping the economy but it also helping the environment. We can all set here and talk about what needs to be done. But at the end of the day someone needs to have the Initiative to make it happen. It's never too late to do something about the deficit, the only question is whether there is the will to do something about the deficit. We have a President that is only concerned with his agenda (and not its cost to America in the future), Democrats trying to protect their jobs, and Republicans who will protect their programs regardless of the cost. Hey, maybe there will be a honeymoon period after the election and Congress does something for the American people. Oh, wait, Congress. Oh well. Maybe we can make a resolution not to fight anymore useless wars like Iraq. That went a long way to adding to the deficit. It would be a good start if Wall Street would give those $144 Billion in bonuses they will get next month back to the American people, or at a minimum to pledge to use the money to buy only American-made products. The rest of the deficit can be solved by ... oops. Gotta go, there are two black helicopters circling my house. Not at all. 1st come home and let afganistan fall. that should ease our dependance on China. Second lets cancel all price supports and foreign bribe money going out . 3rd cancel all raises for elected officials .including health insurance and pensions. also make congress pay into the soc. security fund.out of their wages. Last .lets cancel nafta and cafta and bring our jobs home.no more tax havens for american corps. All the leading economists have said that if we let the Bush tax cuts for both the wealthy AND middle class expire at the end of the year, the deficit will go away after a few years with no spending cuts required. If we figure out some spending we're willing to cut as well- and no Republican politician or candidate for office has specified a single program that he would be willing to cut in an interview or debate- we can reduce the deficit even more quickly. with nothing being done about the two ongoing wars and crippling Defense spending, it is too late. With whispers of our being pushed into a third military conflict in the Middle East, thanks to our 'closest ally', the hopes would fade way altogether if that happens. No, it isn't too late it just is hard too imagine it being done. If we do not get out of Iraq and Afghanistan it will not happen in the next 2 decades. War is not cheap and two wars well that is just financial suicide for a country. We only need to look at the rest of the world to see just how much financial trouble we are in. When China and other countires are being paid 65 percent of our Gross Domestic product in interest payments we got some serious IOU'S out there Jack. No indeed, it is not too late Jack. However, they better move quickly as there are only 9 States with AAA ratings. Some States such as Michigan, New York, California, Illinois, New York would all be in bankruptcy if they were a business. What do the above States all have in common....think about it ! Jack, your questions are those of a person needing instant gratification. The great depression took over 10 years before anything meaningful happened and that meaningful event was the gearing up for WWII. My fellow Americans are thinking like spoiled children. There is no quick way out of this deepest of recessions. Stop crying buckle down make due with whatever resources are to hand . There is no magic bullet so forget it. Absolutely not. The deficit can be dealt with if the politicians would work together and not be such pains in the you know what. I am so sick and tired of all of them acting like little spoiled brats. Never too late. With renewed confidence returning to America after a "house cleaning" on Nov. 2 mid term elections, Americans can do amazing things when confronted with the "impossible". The LUNACY will take a while to reverse but reversing it we must.........................and WILL accomplish. Of coarse not Jack it's never to late. It's just that sometimes you need a little patience and some common sense. Ask the people from New Zea land that woke up one morning and found out their dollar was worth about a nickel. They learned what they could really do with out and rebuilt their country from the ground up. Just like Iceland is doing right now. You just have to have the guts to face your situation and think about the good of your country instead of just yourself. It's time for America to stop being the war monger it is and look after it's own backyard. Stop spending and giving money in aid you don't have. How many billion did America give/lend in the last 10 years to other countries? Wake up you just can't afford it anymore. The rest of the world will survive without your Visa card. Can you imagine how strong and healthy America would be today without that 13 trillion in debt? It is NOT too late. The International Federation of Accountants (IFAC)should Audit the US Government and Advice meaningful measures to get out of this deficit! US government should implement the latest International Public Sector Accounting Standards (IPSAS), which are recommend and can be funded by the World Bank! Not too late - need to change the rules of the Senate so we can make tough decisions though. This gridlock paralysis is a big flaw in our system. Jack...in many ways it may possibly be too late. Most Americans don't realize that our current national economic situation is just a stones throw away from being like that of Ireland, Italy, Greece and other nations with very bad debt, inflation, recession, etc. The only thing that is keeping us propped up is the fact that nation's like China that own 1/3 of our debt have to view us as "too big to fail". As long as our current political system rewards our elected officials in Washington for selling out Democracy & and our national sovereignty for personal profit, nothing will improve. This is kind of like global warming; we can't stop it now. This is the natural cycle of life as the result of greed, pride and ego run amuck in what was at one time the greatest nation in the world. I really feel sorry for my grandkids as they aren't ready for living in a 3rd world country. It is never too late to do something about the deficit. The question should be is there a 'strong enough will' by our elected officials and the American people to do something about it. Quite the whining, finger pointing, political manuevering and get down to business. That is what we all need to do. There is one way to stop the bleeding and that is to require companies to manufacture products in America if they want to sell them here. Unfortunately, our Congress will not do this because they get paid off by big companies and we have the audacity to call Afghanistan and other countries corrupt. Jack, I don't know if it's too late but we're getting their fast. What we need is Washington to stand up and say all of bush tax cuts need to be repealed and other cuts need to be made or we will go bankrupt. Everyone knows this but are not willing to accept it. What needs to happen is what happened in the UK where they were brutally honest with their people. But their gov't isn't controlled by lobbyist and special interest groups. We need to stop fighting wars on a credit card. The deficit is an event horizon and cannot be avoided. We have committed our children and grandchildren to an unbelievable future. As long as the federal government spends more than they take in you have a deficit. Twenty million people out of work doesn't help the matter. I'm not hearing from the TeaOP that their candidates won't take a "government"salary or the "government-run" health-care benefits that we all give them. I don't hear the GOP vowing to cutoff their families and their retirees from "government run" heath-care. I don't hear them saying that. I wish the TeaOP would walk the walk. Jack, as long the TeaOP/GOP keep shipping jobs off to communist China. And millions of Americans keep losing their jobs. We will never have a balanced budget, maybe what we'll have, is another Civil War! Jack: Yes, I think it is meaningless to even think of anything being done-and with the upcoming midterms elections-–well-Words pay no debts. Did you know Jack that when I was born, I owed twelve dollars-–and that has substanitally increased over time. There is no light at the end of the tunnel for me–my children-my grand children-great grand children-and great great grandchildren. Everytime we think to see the light-the government increases the tunnel. at moment senator murray did s.s.a.marine a favor (which her husband works for ) , when they were allowed to sublet the port charges and got to keep the money instead of paying the debt off for the use of the terminal infrastructure.. the result , our libraries are closing earlier due to budget deficits. the deficits stem from the ports raiding our property taxes to cover the bond payments for the cruise /shipping terminals . whyy is the U.S afraid to charge the proper port rates throughout n.a.f.t.a? is it that we have a 2 party sellout syndrome coming from paying off our senators?? We can lower the defense budget, and incrase taxes especially on the very wealthy Americans. What is your definition of meaningful, Jack? The most important solution is job creation, and since big business has joined the republicans in delaying any kind of improvement or advancements in the economy, the only alternative is for the government to try and create jobs. It used to be that although there were difference in opinion, when it came to what our country and the American needed, politicians united. This is not happening and appears will not in the near future. Putting politics and winning at any cost over our survial HAS to stop!! Is it too late to do anything meaningful about the deficit? We had deficit reduction under Clinton and I am sure we will see it under Obama if he is given the full 8 years and enough Democrats for a Super Majority (since the Republicans abused the fillabuster). Otherwise the Republicans will spend continue to spend our grandchildrens future into oblivion. Jack: There is no remedy against this consumption of the purse, borrowing only lingers and lingers it out, but the disease is incurable. Millions of Americans drive a mortgaged car over a bond-financed highway on credit-card gas-–doesn't get any meaningless than that. To end the defcit we need to tax televvision comercials for election campaigns and entitlement programs products that currently overwhelm the people's airwaves. A Tax on everything advertised free ; such as electric wheel chairs, bathtubs, prescription drugs and tax representations should eliminate the deficit and insure children won't be taxed for soda pop. The deficit accrues daily. Everyday is a good day to do something about the deficit. stop two wars. Cut military costs. stop borrowing money and start saving, See Germany for help. include the cost of recycling into the price of products. Only common sense and controlling the totally greedy lairs now controlling the corporate owned media. No, not too late. Trim a lot of useless spending, clean up some of the entitlement programs, get rid of Military Bases overseas that are no longer purposeful and tax the dickens out you wealthy people, Jack. It's never too late to do something about the deficit. However, anything meaningful is going to hurt a lot of people in the short term. That's the problem with our system. The people who run the country have to think short term to keep their jobs, but all of our problems are long term. Never too late to do something meaningful or maybe even constructive. Small chance since neither party understands the need for fair trade. No, Jack, it is not too late to do anything meaningful about the decifit. We can quit pandering to the rich and let the Bush tax cuts for the very wealthiest Americans elapse. Where are they going to go to have it better? China? We can get out of both Iraq and Afghanistan. It will be cheaper to remove our troops and supply arms to various factions than to keep these countries occupied. We can take a good look at the legal system in this country. If we legalize marijuana, it will take a big strain off of our federal, state and local law enforcement and prison systems. We can begin to penalize corporations that make multi-millions of dollars in this country while employing multi-thousands of people in third world countries, helping our economy by forcing job creation here at home. We can do something if politicians will get off the fence and turn a blind eye to the big money interests like the U.S. Chamber of Commerce and work with the interests of America instead. $13+ TRILLION DOLLARS is a pretty big nut to crack Jack. If the nations of the world were to call due tomorrow what we owe them today, we'd all be speaking Chinese on Wednesday. America's situation is kinda like the guy who swam half way across a lake, decided he couldn't make it, and turned around to swim back. (They're still looking for him). No it is not too late to do anything about the deficit. The solution is simple. Start pumping money into the bottom 20% of the taxpayers pockets. This is the part of the economy that is in a recession. The millionaires do not need any more money to funnel into their "tax deferred investment accounts." The business sector can not expand until the consumers start spending, and large number of consumers do not have money to spend. The US economy is just like the mortgage market, the housing mortgages turned upside down when the consumers could no longer afford to make their payments, but most of our economists and elected officials still have not figured this out. The problem is extreme, but its is never too late to make a balanced budget a fixed law. Clinton has shown that a balanced budget can work. The government has to slash spending and reduce its size so that it can sustain itself. We can not allow ourself to start defaulting on our loans and collapse financially. It is not too late but with a government that is clueless it is plain to see that no effective remedy will be forthcoming from either party. Congress should begin by cutting back on it's members bloated benefits and waistline. Thats a start. No. It isn't too late. Get the hell out of Iraq, Pakistan, and Afghanistan. Stop spending money on futile "wars." Ban importation of goods produced by American companies off shore. Put hospitals, churches, and universities on the tax roles in 2011. Close all tax loopholes for businesses or anyone and put a flat tax into place in 2011. Just for starters. Tampa, Fl My only suggestions would be to reduce all 535 members of Congress's salary to $0, no perks, and no retirement packages. They are all millionaires that can raise millions of dollars to run for office, I'm sure they can get by on just the bribes they get now. Obama could set a great example by only accepting $1/year like Gov. Arnold. Now that would be getting serious about the national debt. Until the American middle class gets back on solid ground, we need to subsidize them even at the risk of raising the national debt. People are more important than economics. When employment is once again stable and we finally get out of Afghanistan, the tax base will be re-established and we can begin the enormous job of reducing the deficit. The problem isn’t that it’s too late to do anything about the budget, the problem is that there is no one who can do anything about it who is willing to do anything about it. That has always been the problem. 14 trillion dollars in debt and there is no way to pay it off. I find it funny that the president wants to focus on fiscal discipline after he just rammed a trillion dollar health care bill down our throats. He is part of the problem. Unfortunately, I will have to work for the rest of my life and pay more in taxes because of the president's spending. In other words, he got drunk and we're getting the 30 year hangover. Okay, now that I've stopped laughing at what our current group of elected officals have said, I think it's not too late to do anything meaningful about the deficit. All we need is a number of people like New Jersey Govenor Chris Christie. People with the guts to stand behind what they promise during an election campaign. People who care more about the United States than they care about keeping things status quo. No, so you shouldn't bother asking a silly question. Yeah that seems about right–keep the tax cuts for America's richest and get rid of the mortgage interest deduction which really benefits we middle class Americans. Nothing will get done–everyone will talk it to death. My first step–get out of the two wars in the Middle East and don't look back–that would be a good start. Understand that whoever wins the coming election has two choices: first either raise taxes to cover the debt or be ignore it and watch America become a thrid world country with nukes. Never too late. Like Eisenhower said we need to stop blowing up our dollars in foreign wars. We also need to stop rewarding companies for exporting our jobs. If every Republican filibustering to keep exporting jobs were defeated in this election, they'd understand just how important having a job is. The party of no is also ruining the lives of hard working Americans to block the political process so they can regain power. it is truly an embarrasement to be an american in this electoriate. i would leave but no job, which means no money which means no gas which means unhappy wife which means no good times for me if you no what i mean. "Time will tell. I look to Canada, who is a different part of the same Industry; called North America. But all the USA do::: is try and isolate one from the other. This infighting for business just gives the business to other organisations, like Europe! China! India! Etc. When Canada and the US get a boardroom, and a chairman or two; who can work together like a major cooperation. Then??? Maybe! our elected NONrepresentatives have no intention of addressing the deficit and debt. progress could be made by closing military bases around the world (no country has bases in ours), stopping the nonwinnable war in afganistan, only clean bills, absolutely no pork barrelling, stop giving money away to this or that cause. if you really expect our elected NONrepresentatives to do something to help the people not their special interests/corporate America I have some ocean front property in Wisconsin for you. It is not too late to do something meaningful about the deficit but that would mean raising taxes and most Americans only care about themselves and are not willing to pitch in. Politicians need these knukleheads' votes so they are not willing to suggest that taxes need to be raised. Only if Conservatives won't allow the tax cuts for gazillionaires to expire. If they return to pre-Dubya days, it'll be smooth saing for everybody. Look how quickly the Economy recovered from Reagan & Bush I, when Bill Clinton simply raised taxes for the obscenely wealthy; 22.8 MILLION JOBS were created! No, it's not too late, as long as Republican'ts decide to get on the side of the American people, & do the right thing. They have to stop trying to make America/Obama fail, & get in our corner, so we will have the rest of what we voted for in 2008. Jack, this article that you posted is a perfect example of fear mongering. Enough already. Its a despicable behavior by the press and it needs to stop. You are making things worse than they need to be by irresponsible reporting. Stop all section 8 housing, that free rent to people that don"t work. End the two wars now; so far we spent over a trillion dollars that 1 000,000,000,000,000,000.dollars. End all foreign aid. Close down the C.I.A. they do more harm than good. Start antitrust -enforcement laws that Reagan killed to bring back American jobs. The party is over, but no one wants to admit it. It looks like Europe is beginning to see the light-and it isn't pretty. The fiscal "house of cards" is falling and I don't see a line forming made up of tax increase/reduced spending volunteers. I can see the inflation train coming as the Treasury printing presses get humming. Crooked is crooked no matter what color it is. Nothing will change. Our only hope is to institute strict term limits. That way, they can only be criminals for a limited time. Republicans vow to shut down the Government if they gain control of the the House of Representatives. Since they can do this by cutting off Government funds, how will I get my Social Security check? How will I get my Mail? How will the Military get their pay? How will Government retired workers get their checks? Will people be thrown out of their hospital beds if they are on Medicare? Will republicans really wreck the train so it can't be put back on the tracks? I am angry and scared to death of the RepublicanTea Party! We could solve all of our economic problems. Put 20 million people to work. Increase the GDP by a few trillion dollars. Create the money needed. We don't need to borrow and tax. Where does the Constitution say that the banking industry has the right to skim the cream off of all money milk. America is a republic. Congress can make any law it wishes. The Supreme Court can determine if it is or is not Constitutional! Copy and e-mail to everyone you know! It's not too late. We can stop the train wreck! most of that jack was under president Bush. Obama should have let the economy to fail both the banks. insurance companies and major industries so the public would know how bad the republicans had worked with big business to make us a third world country while giving tax breaks to the wealthy and big business to include companies owned by foreign companies. we had two wars by the republicans but were not in the budget but a big part of the debt. we should give the government back to the republicans so our children can meet the new owners in the next twenty years. Simple...Just ask Bill Clinton. He took daddy Bush's deficit and turned it into a surplus only to have baby Bush flush it down a garbage disposal. Jack, I hope the answer is NO, however, you can bet there are NOT going to be any easy answers. I do feel that if we are going to address the deficit, we must make deep, across the board cuts, and revise entitlements for the next generation. If Washington can't fix welfare, and fraud in government programs like Medicare/Medicaid/Social Security, we don't stand a chance. How about we start with a 15% cut in Federal jobs nationwide, starting with Congressional/White House staff? As far as I am concerned they might as well cut Medicare out. A lot of us can't afford to use it anyway. Medical costs are so astronomical that the co-pay and deductibles are more than I could pay in my lifetime if I ever had to go to the hospital. I have threatened my husband with bodily harm if he ever calls 911 if I keel over, The cost would put us out on the street! We can watch what Brits do and see if it works. We have had our hands out begging for a long time. We could cut , but no one wants the big stuff cut. I for one wish the age to get any kind of social retirement would go up and means test it. If a person is not capable of working disablity would take care of that. We have to know that is really isn't a free anything. I also wish we would get out of other peoples countries. I can't imagine us being willing to have other countries armies with bases here. Unfortunately,the horse is already out of the barn. In the 1030's the Federal government was still solvent while private businesses and Wall Street went belly up. I read over the weekend in some article that this time the government can't help out because It also is belly up. The suggestion I read was that some international group such as the World Bank will have to bail the US out. This will mean that we will not be our own country anymore as we know it. My suggestion is to STOP the Wars and use that money to pay down our debt. It is probably our only hope. Well Jack We Wondered The Same Thing Back In The 90's Back When The Clinton Administration Balanced The Budget! If The Obama Administration Would Raise Taxes On The Rich And Cut Goverment Spending We Would Be On The Way To Balancing The Budget! If This Doesn't Happen Then We Better Worry! The bipartisan commission was supposed to show in detail what types of things must be cut, and by how much, to balance the budget quickly. If it turns out to be fluff, as your question says the experts believe, then CNN should do a piece showing the strong statements made by the President when the commission was formed, versus the actual recommentations. The comparison will surely show what obscene liars the American politicians have become. Meanwhile, the yearly deficit remains gross and the accumulated debt gets more ominous. It's funny to hear Repubs talking about how awful it is to run up the defecit and national debt, when they took a budget surplus from Clinton and turned it into a huge defecit in a few years. Which administration has added the most to the National Debt in the past 50 years? George W. Bush at $4.9 trillion. And it was such wasteful spending that the economy plummeted. Obama has increased it by about $2 trillion, and the economy has turned around as a result. The defecit spending of the past 20 months has saved this nation from total economic disaster. Let's not forget that. Now that the economy is improving, it's time to look at cutting spending and balancing the budget. I love the Repub approach of – if we're out of money, let's cut taxes (especially on the rich) so we bring even less in!! Dumb. It's never too late to do something as it will lead to something else. Our problems are huge and no one knows how to fix them. It's time for our government leaders to step back and start with small changes. Cut spending but make real changes. Our elected officials could fly commercial flights to reduce costs that come with private jets and take the subway and save on drivers. They seemed to point this out to the auto industry leaders when they all flew their private jets into DC commenting that they are broke and cannot afford such expenses. Well our country is broke and they should not treat themselves so privileged. They also need to take small steps in changing Medicare and Welfare. These 2 areas alone have been mismanaged for too many decades and there is no overnight fix, but small steps can lead to a good solution. Everyone needs to step up with the tax breaks. If the truly wealthy would pay their fair share of their tax rate, it would help. The truly wealthy pay lawyers to find every deduction possible and then donate large sums of money to claim more deductions. As we seem to have learned over the past few years, so many government workers are hiring illegal aliens and there is another tax savings. If our leaders do the same old things that do not have a chance at working in this century, we will see an America lead the charts with poverty and homeless, uneducated citizens and worst of all – no hope for any kind of future. Jack, neither party is serious about reducing the deficit, it may be too late. Problem is, Republicans want to cut just about every "safety net" program we have with unemployment still high, the number of elderly increasing, and wages being stagnant. Why is it Republicans always attack good programs and ignore the real waste such as in the military as well as continue to give giant tax breaks to those who really don't need them in the first place and don't pay taxes anyway. The wealthy. Jack, the way I see it is that our nation's GDP is about $13 trillion dollars per year and our total debt is about $12 Trillion. This seems to mirror the debt of a lot of our citizens, some of whom still manage to get by, although nothing is easy for them. You can rack up $100,000 in college debt in a heartbeat and you'll be a minority if you get a $100,000/year job with that education straight out of college. The debt isn't pretty to look at, but that's what you get when you live beyond your means. If it were an individual person who was fearing losing their home, they'd work hard to live on a budget, but when you get a group of people (Congress) who make 6 figure incomes for part time jobs that allow them to live and work in fancy offices, fancy buildings, fancy cars, fancy homes, and fancy parties, there isn't a lot of incentive to live on a budget. I don't think that anyone in Congress is seriously worried about becoming a homeless person any time soon, and until they are, there won't be anything significant done about the deficit. We're at the point now where the only way we'll ever be able to balance the budget is to gut the government, fire Congress (all of them), change our election system immediately so that the power vacuum won't immediately be back filled with more corrupt politicians, and then maybe we'd have a shot. That's not going to happen, so welcome to slavery, Jack. It's nice to know that your job may actually pay the bills... mine won't. No. One only has to look over in Europe to see what the consequences are of doing nothing. The U.S. is in the same predicament as those European countries and delaying the inevitable will only make the truly hard choices even harder. The only question is who has the courage to step forward and do what has to be done regardless of the political consequences. Because if you're truly serious about it, its gonna hurt. (see above) I'm in Seattle, Washington. Our local economy is good, but that doesn't make up for the government. Thank Bill Gates. The interest on our debt alone is reason enough that it is too late. The only thing we can do is go into default, declare bankruptcy and start over fresh...Ooh, the Chinese are shaking in their boots that this may actually happen. Yes i believe it is too late. We run trade deficits even when we have a "growing" economy. That means the economy is not going to rebound until it is rebuilt. What is going to happen, and probably in the near future, the debt will be eliminated with worthless dollars. That problem will be solved but ours sure won't. I think most Democrats and Republicans would agree that federal and state programs that pay people for having children they can't afford makes life in the U.S. impossibly expensive for responsible people. Hey everyone, there's an elephant in the room – let's talk about it. The first thing we need to do is give our leaders a 20% reduction in wages and benefits until they balance the budget. And let them buy their own medical insurance and build their own retirement fund. Let them feel our pain. And our grandchildren's. This could help them to get serious about their job. We are paying our representatives to much for nothing accomplished. Maybe we should let them know what the rest of the world knows. (We had eight years of greed and blind eyes.) They need to stop all charity too other countries. Until they can heal their own homeland. Here's my solution Jack. No paycheck for Congress, the Executive, the Judiciary and mid-level G.S. until something meaningful is done about the deficit and we get to vote as to when and if they get paid again. Seeing that the deficit has raised $5 Trillion under Pelosi and $3 Trillion under Obama out of the total of $13 Trilllion, Pelosi and Obama should be required to give all earnings from books to paying off the debt instead of raising taxes on the rest of us to pay for their pork laden spending. Too late? No, but it has to be done right. If you want to dismantle a pyramid you don't do it from the bottom up, as the Republicans seem to think. Think of Maslow's hierarchy of needs: those items on the bottom are the most important. If you are having budget problems are home you don't cut the food budget, you cut the cable TV. The government can do the same. Jack if this government was serious about fiscal responsibilty, then they'ed start closing some of the 140 military bases in foreign countries around the world! Why do we have to so many U.S. bases? I can't think of another country that has a single foreign military base, why are we so special? How much does this cost? No, it's not too late. Look at what Clinton did with the Reagan/Bush deficit. With intelligent stimulus to the economy and the guts to raise taxes when its necessary, an administration can lick this problem and turn it back into a surplus. Well, okay, it really is too late for the Republicans. The mindset, and I use the term loosely, of politicians is that nobody likes taxes. That's why we pay hidden taxes through the products and services we Americans pay for. That's why it is too late. With the best politicians money can buy, we are doomed. What about the part where the US deficit shrunk 9% last fiscal year ending September 30th? Not great, but considering the corporate bailouts, corporate tax breaks, and depression and all, it’s a start. I would think as a member of the most trusted name in news, that you would be sharing this information, too. But anything good the Dems do gets buried. Why is that? Not good for business, or what? Jack, I think we are half way there on being too late. There is still time to cut expenses, which Democrats will not do. Personally, I would love to see Republicans and Democrats completely voted out of office and get real people in there without any affiliation to either party. There was dire financial hell under Bush's reign, and it has continued under Obama's. This country simply does not have the time, resources or will necessary to help the President or Congress implement the necessary changes in time to prevent the United States from going bankrupt. Obama has demonstrated that he is an ineffective president with poor communication with the American people. It's never too late. Everyone agrees something needs to be done, but they never want to have to sacrifice or negatively impact their lives. There are numerous things we can do, raising taxes, even temporarily, without a drastic cut in spending will only make our economy worse. We have the most robust and responsive economy the world has ever seen, but the direction we are heading is a dead end. Tinkering around the edges, like they always want to do, is like shooting a bb-gun at a tank brigade. Sure, you are "doing" something to combat the problem but you will end up a big-time loser in the end. It was too late two years into the Bush-Cheney administration. Orin Hatch said it best when he said it was standard operating procedure to not fund anything. Now everybody is up in the air about it blaming what has been spent by necessity to salvage the economy. Too late. Jack there is very little to do at this juncture that will fix the economy quickly. There is no more money to take from one project and spend on another unless we borrow it from another country. America no longer has an economy. It is now owned by foreign countires who own our debt. They will be the ones to decide our future. We just have to stand by and watch with our mouths open shaking our heads wondering why..
Let the Bush tax cuts for those over $250K in income expire or they will ad $4 billion to the deficit. Jack, anything done to the deficit would be mean& full of crap. Democrats keep adding programs and Republicans keep cutting taxes and both add to the deficit. YES I hope it is to late. That way neither of them will be able to add to it. have to pay, and so on. I'll be dead by then, Jack. No, it isn't; we just need to start cutting farm and oil industry subsidies, to name two. The list of stealth pork to corporate fat cats is very long. It's too late for the Democrats to do anything other than keep blaming Bush. They have had plenty of time to get serious about jobs for OUR unemployed that would have started our economy going in the right direction which would have a positive impact on the budget because fewer people would be dependent on state and government handouts. Imagine the impact of 6+ million replacing illegals in the workplace and sending illegals home which keeps them out of our ER where we are forced to pay for it as Obama admitted. That's a win-win for workers and state and federal governments!! It's not too late but unfortunately I don't believe either party truly wants to cut spending and reduce the deficit. Our politicians now view getting elected as a reward, not a responsibility. It's never too late to correct this horrible problem that our governement seems to be doing nothing about. One example would be to legalize Marijuana. Legalize Marijuana nationwide, tax and regulate it. It will help ease the pain and start a growth of the economy. Too late for republicans who put us there in the first place,not for the rest of us who knows it doesn't take just 2yrs to dig yourself out of debts. If we keep on beating each other in Washington,we will be in this debt forever; republicans will come up with strategies, democrats will block it,when Democrats takes over power they will come up with strategy and the party of NO will definitely say no. So whatever it is,it's not too late,the economy is recovering for Christ sake,politicians should stop twisting the story with the help of you guys, the media. Well, with "austerity measures" I guess you can just beat up the poor and the middle class more. What Austerity Measure would affect someone making $250K a year or more? The wealthy need to pay their fair share, before the pitchforks and torches show up at their doorstep. I'm for raising the age for Social Security to begin as long as safeguards are in place to ensure that I'm can be employed until I'm 65 or more. Single payer, as counter-intuitive as it sounds, will eventually make Medicare and Medicaid needless. Progressive programs are the way to go. Section 8, of the Constitution to solve the debt problem. Why don't you Man-Up and discuss it? Its not to late but it is getting close to too late. We HAVE to first attack the four top budget killers we have, Social Security, Medicade, Medicare and the MIlitary. First thing we need too take a look at all four and attempt too trim the fat as much as possible without reducing those programs benifits. After that we need too take a hard look at jobs and why so many jobs and money is going too china and take steps too stop that ASAP. After that we will have a better handle on exactly were we need too cut our beloved big four budget busters. No, it's imperative that we do something about the deficit. We can start by taking control from the failed Keynesians and welcome some other economic theories i.e. Austrian Economics. But we can't even get Paul Krugman to debate an Austrian. Tax cuts? Stimulus? Cut every persons taxes and that will create some stimulation. 2 trillion dollars a year in Social Insecurity and Medicare. The War Machine. Government intervention and regulation and the money hungry alphabet soup. These are the things costing us the money, but people don't want to talk about that. If this country's financial situation was turned over to a private accountant it would probably eligable for bankruptcy. Our tax code looks like it was written by greedy psychos for greedy psychos. The mechanisms they use to collect revenue are warped and our governement's spending habits are completely dysfunctional. From the standpoint of fiscal responsibility this scenario is unsustainable. We either fix the problem or the bottom will one day drop out the same as it did on Wall Street. Those responsible will run for cover leaving the people that elected them holding the IOU. No, it isn't too late to do something about the deficit. raise the age for social Security benefits to 70, and add an increased $1 national tax of gasoline. It won't be popular, but neither is the deficit. It is past time for us to pay the piper. ALL Americans need to get ready for a big change in life and entitlements. Military and all the wasteful spending that Wash. needs to get slashed NOW! While I'd like to think there is something we can do, but what can we do really? The number is getting to a point now that we can't even truly grasp how deep we're in the hole. You can help here in the there but look at the past, Clinton did well with it but later we dropped the ball. Pushing blame on any one party isn't going to solve the problem it really is going have to be a bi-partisan effort and even then it will be more work than those in power are willing to put into it. So perhaps not to late but it soon will be and what then? Why is that no one ever mentions the fact that much of the stimulus money given to the banks has been paid back and applied to the deficit? Why is that no one notices that the banks are doing quite well while holding on to their money and borrowing from each other but refusing to lend money to small businesses? If you want to cut the deficit you create new streams of income (jobs, businesses, industries, etc.) not cut the life out of an already devastated economy. With deficit cuts the future of our education, health and environment will suffer, leaving us ill-equipped to compete with the rest of the world. Yes,it is far too late.This opera started a long time ago,not only has the fat lady sung,she has taken her bows and left the building. No it is not to late. Roll back tax cuts for the rich, revise welfare to work, and create a government insured mortgage investor loan program;stop engaging in baseless wars, stop arresting and imprisoning citizens for misdemeanor offenses and we will save trillions. The best way to wipe out the deficit is to grow the economy! That is what this country has done in the past. In 1938 Republicans were saying their grandchildren could never pay off the debt. Well we did by growing GDP. If we cut all government spending the we will continue to go farther into to adepression! The only gains we have made in the last two years have occurred because we had a deficit. Pay attention to the facts!! Yes, it is too late to do anything about the deficit. With mandatory spending such as Social Security, Welfare, Unemployment, Medicare and Medicaid and interest on what we've already borrowed taking over 90% of federal revenue, no politician wanting to get reelected will talk of cutting any of this. And no one is brave enough to talk seriously about raising taxes. So, our goose is cooked. We need to learn as a country that if we want the government to function with all these necessary programs, we have to either truly pay for them or seriously prune them back. It's never too late to rebuild the manufacturing sector, Jack. We need to make steel and steel bi-products. Build high-tech clean, green steel mills all over the Country. This will create a lot of jobs in all sectors. Mr. Obama talks of this "high-speed rail system" – whose going to make the steel? He speaks of infrastructure – who is going to make the steel girders for the bridges, etc. With advent of Global warming – all construction should be steel; leave the trees a lone! The part of the equation that is missing is the manufacturing sector; Nixon & Reagan outsourced America; we need to bring it back, NOW! My message is the same-I don't have a clue what Mr. Obama is waiting for? Whatever positive measures are taken to reduce the national debt, they must be advertised so the American people are encouraged. Hang a "Debt Reduction" clock in Time Square that shows the numbers dropping by the minute. Too late, Jack. The patient is going to die on the operating table this time. For 35 years to this point, each paycheck I have received has had money removed for Social Security and Medicare. I still have some years to go before I reach the age I can receive it, but how is something I had no choice but to pay into considered an entitlement? The entitlement came when politicians felt entitled to spend the money people were forced to contribute to it. The biggest deficiency in this country is sitting in those seats in DC. It's not too late to make a change there, if folks will just wake up, smell the roses, vote these people out and do the same in 2012. Obama promised us change and when I look in my pocketbook that is about all I have left. As the saying goes "fool me once, shame on you, fool me twice, shame on me." Lesson learned. BTW, why did Congress vote themselves raises and then decide people on Social Security didn't need a cost of living increase? Jack the deficit is like a credit card bill. There has been no new deficit spending. Obama cut the deficit from 1.4 trillion to 1.25 trillion. In other words, the Ds are spending less than the Rs did under GW Bush. You want to create jobs? If you go on welfare, you have 12 months to enjoy it. If you are granted unemployment check, you have 12 months to enjoy it. Then you are CUT OFF. Next, the government needs to put more money in our pockets. How? Open a government power company and a government insurance company. Since it is taxpayer and not for profit, you can charge low rates that will make the competitors compete or die. Some of the resulting increase in disposable income can support subsequent tax hikes across the board. Next, legalize marijuana and tax it. Raise alcohol and tobacco taxes. During almost three decades spanning 1951 to 1980, when America's top marginal tax rate was between 70 and 92 percent, the nation's average annual growth was 3.7 percent. But between 1983 and start of the Great Recession, when the top rate was far lower - ranging between 35 and 39 percent - the economy grew an average of just 3 percent per year. Supply-siders are fond of claiming that Ronald Reagan's 1981 cuts caused the 1980s economic boom. In fact, that boom followed Reagan's 1982 tax increase. The 1990s boom likewise was not the result of a tax cut; it came in the wake of Bill Clinton's 1993 tax increase. – During the Bush years alone, from 2000-2008, median family income dropped by nearly $2,200 and millions lost their health insurance. – The 400 richest families in America, who saw their wealth increase by some $400 billion during the Bush years, have now accumulated $1.27 trillion in wealth. Four hundred families! During the last 15 years, while these enormously rich people became much richer their effective tax rates were slashed almost in half. While the highest paid 400 Americans had an average income of $345 million in 2007, as a result of Bush tax policy they now pay an effective tax rate of 16.6 percent, the lowest on record. – Last year, the top 25 hedge fund managers made a combined $25 billion but because of tax policy their lobbyists helped write, they pay a lower effective tax rate than many teachers, nurses, and police officers. Warren Buffett, one of the richest people on earth, has often commented that he pays a lower effective tax rate than his secretary. – As a result of tax havens in the Cayman Islands, Bermuda and elsewhere, the wealthy and large corporations are evading some $100 billion a year in U.S. taxes. – In 2009, Exxon Mobil, the most profitable corporation in history made $19 billion in profits and not only paid no federal income tax - they actually received a $156 million refund from the government. In 2005, one out of every four large corporations in the United States paid no federal income taxes while earning $1.1 trillion in revenue. So we have massive unemployment, depleted savings accounts, people literally so broke they don't know how to survive and yet, it doesn't have to be this way. Think for a moment of the history of America over the past hundred years and try to recall a time when the middle class and working class were doing well, at least as well as can be expected at the lower half of our economic universe. Was it after the New Deal? After World War II? During Clinton's tenure in the 90's? While we can discuss the peaks of economic balance, we can also identify the worst disparities in economic strata: the Great Depression and the Bush years and their respective aftermaths. It would be difficult to find a positive trend during any Republican administration in recent times but the period under George W. Bush surely qualifies as one of the worst ever. The Republicans only success has been convincing Tea Partiers and Grizzly Mama's that everything we are suffering through is Obama's fault. The unfortunate thing is many of them will actually be voting for the same people who helped create this disaster. A recent study has even shown how income equality makes the poor more conservative, a fact that can't be lost on the Republicans who have worked as hard as they can making the lower 99% as poor as possible. Find me a President that has done a better job than Bush on creating monumental debt out of a positive economy and budget surplus. Not paying for two massive tax cuts for the wealthiest Americans, two major foreign wars and a Medicare Prescription Drug bill has left us in a hole so deep it threatens the global economy and our social fabric. President Obama has no easy choices to get us out of this hole, and unfortunately, no help from the other side of the aisle. The same Republicans who helped Bush pass all these budgetary nightmares have been blocking every single one of Obama's efforts to try and solve the problem they caused. America's defense budget accounts for almost 46.5% of the entire world total; China's defense budget: only 6.6% according to Stockholm International Peace Research Institute Yearbook 2010. Cut that in half, and you will remain with 23.25%. In 2010 fiscal year, the U.S. defense budget was $663.8 billion in total. If the defense budget is the only thing that is to be cut in half, we will be out of debt in 2034. Will it happen? I do not think so. "You want the terrorists to win" – that is what Tea Party Republicans war lords are going to say while preaching fiscal responsibility. Hypocrisy, well, it is the root of politics, no? It is not too late it is just that obama the dems and pubs are not going to do anything about the deficit. All of them are corporate lackeys working for banks, wall street, defense contractors, and lobbyists. Obama and congress need to immediately raise the top tax rate to 90%. eliminate all corporate welfare, and cut defense spending 25%. it is already getting better. Give our President eight years like the last one had and he will have the mess straightened out. Please no palin though. I'll bet she can't even figure out how to take care of balancing her check book.